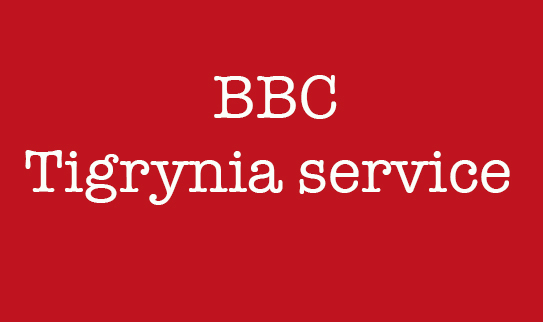 Ever since the BBC had declared its intention of broadcasting in Tigrynia, its real motive had not been clear. To those of us who were aware of the constant anti-Eritrea propaganda war that was being waged, at the time were in no doubt that the BBC’s new service was going to be yet another front in this psychological warfare against us. From the very outset it was clear what the line of attack on Eritrea was going to be. The service was determined to portray Eritrea in the worst possible light and paint it as a failed state, while promoting Tigray, the Northern province of Ethiopia where the Tigray People Liberation Front originated. Every Eritrean that was featured was always described as a refugee while Tigrayan refugees were never featured, despite there being an abundance of them as a youtube clip (https://www.youtube.com/watch?v=bos78JfyRAI ) of them meeting in London shows. At this meeting they were discussing the food shortage that the people of Tigray faced and the false information being propagated by the TPLF about economic growth in Tigray. Despite these concerns being raised by the Tigrayan refugees living in places like London, not once has the BBC Tigriynia service featured them. So why is this? Is it because the service does not want to taint the image of Tigray? Or is it possible that none of these refugees want to be featured as Tigrayans from Ethiopia, because officials of the countries they reside in, know them to be ‘Eritreans’. In a recent article Ruby Sandhu has written about the BBC’s reporting on Eritrea (https://www.linkedin.com/pulse/bbc-reporting-eritrea-ruby-sandhu/?published=t). In the article Ruby raises the issue of Mr Yemane Nagish’s anti-Eritrea views which he stated in an Ethiopian News Network discussion which was broadcast on 3rd April 2017 only a few weeks before Mr Y Nagish was confirmed as member of the newly formed BBC Tigrynia service. From the discussion, it was clear that Mr Nagish had an axe to grind with Eritrea and held the most extreme views of the four members of the panel. In some instances, even those that sat around the table with him were astounded by the extremism of his views. It was clear from the interview that Mr Nagish desperately wanted the Eritrean government to collapse. A government that he believed was not legitimate. In the discussion Mr Yemane Nagish identified the need to wage a propaganda war on Eritrea when he stated .. drive a wedge to rip it away from the Eritrean people and the Eritrean state. If we are unable to do this, it will come for us after finishing off the Eritrean people. What is most disturbing is that, Mr Nagish was given this opportunity to wage his psychological warfare by the BBC, shortly after he aired his extremist views in public. From the views that Mr Yemane Nagish expressed in the discussion, it is quite clear to me why the BBC chose him to spearhead their anti-Eritrea propaganda campaign. Some might be taken aback by the profound hatred for Eritrea that permeates through the responses of Mr Nagish, but the cynic in me thinks that he was probably auditioning for the position of ‘Chief campaigner’ in the BBC’s stillborn anti-Eritrea campaign and believed airing his views was a benefit and not a hinderance. If the BBC had a modicum of integrity, it would investigate Mr Nagish, just as it would have investigated had he declared that he holds, anti-Semtic, racist, anti-women or homophobic views. But, I doubt they will, as I believe that he was employed by the BBC precisely because he holds such extreme anti-Eritrea views. The Ethiopian News Network was a media network that was setup by the ruling TPLF. Despite the strong support it received by the TPLF controlled Ethiopian government, it was classified as a private media entity. Upon the demise of the TPLF and the TPLF losing its grip on power, the new Ethiopian government pulled the financial plug on ENN, which subsequently collapsed as it had been entirely dependent on the Ethiopian state and could not support itself. The first 12 minis are about introductions and about the manner in which Christmas celebrations in Ethiopia have been dominated by Western cultural influences. Presenter: Today’s topic will be the countries in the region especially Eritrea. We will focus on the current ‘No War No peace’ and it implications from the Ethiopian point of view, with particular focus on the border communities. We will discuss the lack of trade and development in these areas and their influence on migration of the communities. FB: I don’t accept the concept of ‘No War, No peace’. I believe we are at war, we can call it a ‘cold war’ but we are in an active war. We have become accustomed to the kidnapping of people, the exchange of gun fire to such an extent that it is no longer news worthy. We are also in a situation where we are conducting proxy wars in places like Somalia and other similar places. This is why I believe that we are at war. There are two alternatives to exit the current situation. Normally, the existence of a cold war as the status quo, exists only between two comparable countries e.g. USA and Russia. As the two countries involved in the ‘cold war’ can not defeat each other out right, they try to use their economic and other influence to dominate the other and force it to the negotiating table. In the case of Eritrea and Ethiopia, the cold war exists between two incomparable countries. While Ethiopia has a developing economy it believes that in the long term the current status quo is beneficial to its interests as the other side (Eritrea) will be forced to the negotiating table due to the enduring economic hardship. In my view, this alternative might work in the short term, but I am of the opinion that the basis of the assumptions are not sound and correct. FB: We cannot say its a direct war, that is why I believe ‘Cold War’ describes it better. There are always flare ups. There is a situation of war between the two and a solution has not been given to resolve the situation. The situation is very costly for both, although as a country Ethiopia might not consider it costly. But regions within Ethiopia have felt the brunt of the cost and in the past ten years have experienced a serious economic downturn due to the impasse. On the side of Eritrea, the cost is as high as the affected regions in Ethiopia. I have witnessed this economic hardship when I had travelled to Zalambesa. You (to YN) have also witnessed the situation also as you were with me on the trip. In the region, building works are not completed because of the uncertainty of the out break of hostilities at any time. Families have been divided into two because of the situation. The locals cannot engage in development work. In my view, if this is not considered as a cost, then its hard for me to understand what the cost of the situation is. BA: You are right (to FB), I support him in certain aspects. There might not be a conventional war as such, but the Media war i.e the propaganda war exists. There is also a diplomatic war going on. Therefore, even though there isn’t a full scale war, this is war in its on right. The propaganda war is a large aspect. Although I am not too well informed on this sides (Ethiopian) activities, I know on the other side (Eritrea) it is portrayed as if Eritrea is facing a serious threat to its national security threat and that it is in a constant state of war. I recognize that the NWNP concept has its limitation and agree with your view that we are in a state of war. Although there isn’t a full scale war, there are provocations, such as people being kidnapped to be used in gold mining. Organizing and equipping opposition groups is also an aspect of war. In general, although there is no full scale conventional war, I agree that other aspects of a state of war currently exists. YN: Fitsum has presented the arguments of NWNP clearly. The description of NWNP on our side, on the Ethiopian side can be seen to be correct, because we are not being provocative and not causing hostilities to start, even though we are being provoked and hostilities being directed us. Only recently about 80 of our people were taken hostage and while are people are being kidnapped, it is hard to accept the NWNP concept. The proxy war in Somalia has been mentioned earlier. This war has caused us to pay heavy sacrifices. What is currently happening in Yemen cannot be referred to as NWNP. We should not wait until they come to us and wage war or wait until we can hear the sound of gunfire. We know what is happening and we cannot refer to it as NWNP. We might call it a ‘cold war’, war by stealth, but nonetheless the war is there. It is my belief that war is being constantly waged against us. With regards to your question, what is being witnessed in that region (Zalambessa) is very disconcerting, a very sad state of affairs. What we witnessed when we went to Zalambessa was hard to believe. The town does not look as it is habited and is a ghost town. The current state of Zalambesa is not unique to it, but it is the state of all the regions of Tigray that border Eritrea. In these regions, not only are they bare of people, but no development work is being carried out. On the whole, the policy that is being followed is very detrimental to Ethiopia. The situation in the areas of Tigray bordering Eritrea, makes things complicated as most of the young people have migrated to Arab countries seeking work. Even in places like Adi Grat which is not close to the border, the effects can be felt. It was a town that could easily have been developed but at the moment there are no development and trade activities being witnessed there. We are not raising this topic because regions in Tigray are being adversely affected by the policy, but because the detrimental effect on the economy can be felt on the entire Ethiopian economy and because we don’t have peace. What he have not mentioned so far is the case of insurgents being sent over. We have also not mentioned the media war that is being waged against us, which is trying to cause one ethnic group to rise against another in Ethiopia. The media propaganda waged against us is inciting ethnic violence, this is psychological warfare. In a conventional warfare, you can kill a limited amount of people, through media propaganda warfare, you have the opportunity to wage psychological warfare on millions. This is especially true in a society like ours which is backward, uneducated with limited comprehension, when I say ours, I am not only referring to Ethiopia but Africa as a whole, most members of our society believe in the media. Therefore, this is not the time to think we are not at war. AM: As long you have mentioned the media, I would like to say the media campaign to incite ethnic clashes (in Ethiopia) is being carried out aggressively at an institutional level, this is especially true of Eritrea. The media campaign is being carried out over the social media in a well organized manner and with its own budget. The media campaign is spreading hate amongst ethnic groups in a well organized way. They are using all media platforms, including printed books. They are trying to divide our society through books which are controversial and divisive. Presenter: We will come back to that. I want to make clear to our viewers the concept of proportional response that Yemane had touched upon earlier. Is it right to wait until they hit us before we can respond? BA: Sorry, before that, I would like to add on what Yemane had said earlier about the effects of the NWNP in areas like Zalambesa and Adigrat. Tere it has caused the youth to lose hope of living and working in the area and cause them to see migration as the only option. We have also have to state the effects of the NWNP on the other side (Eritrea). If we see it from the people of Eritrea’s point of view, the effects of the NWNP unlike Ethiopia is not just limited to the border regions of Eritrea, but it affects the entire country. We should ask who wants the state of NWNP to continue? Is it the Ethiopian government or the Eritrean government? Is there an entity who benefits from this? We should examine these points thoroughly. The NWNP is in place on purpose/intentionally. If people want to, they can agree amongst themselves, that is if they did not draw some benefit from the NWNP situation. Is this NWNP wanted by the government? We are not talking about the people here. I believe that there is some benefit in exploring these issues further. FB: Our perspectives is always changing. We have raised this issue repeatedly including on social media and have conducted debates. Your perspective on the matter depends on your location. There is a similar thing at the government level. I will leave the analysis of the Eritrean government’s position to others. With regards to the Ethiopian government, there is this notion that only central government/ region is of any consequence and is unaffected by matters on the peripheries of the country. For instance, a resident of the capital Addis Abeba, will not be too concerned about Eritrea as it is neither a physical threat nor a economic threat, therefore they would consider the past ten years as good years. Going to the peripheries, the resident would like to see local issues resolved, eg those in the Somalia region would like the Somalia situation to be resolved, those in Gambela the South Sudan situation and those in Tigray would like to see the Eritrea situation to be resolved. As traditionally the Ethiopian government is a centralist government (mainly concerned with the centre/core of the country), I believe this has caused the Federal government to be comfortable with the continuation of the NWNP. It is because the Federal government is far removed from the borders of Eritrea, that it has made empty promises of proportional response. In fact it was the late prime minster that had told us that the Eritrean case had been closed/resolved. The Ethiopian government does not seem to have a desire or interest to take action against Eritrea. In my view, this apathy is due to Ethiopia being a large country and its centre isolated. Eritrea as a small country should have been worried more. But those in power are more concerned about their own interest. BA: What is the view of those in power in Eritrea and the Eritrean people on the NWNP situation? When you see it from the people’s view, the NWNP is destroying the country. There is extended military service with very low pay on the basis that Eritrea is at war and its sovereign territory is under occupation. As a result Eritrean youth are leaving in their droves. There are a lot of questions being raised in Eritrea. Questions about the implementation of the constitution, democracy, Human Rights issues, free press and a lot of other issues. The government is using the NWNP as an excuse to suppress these rights. It fears that if this matter is resolved peacefully it will have to face the questions raised by the people. Therefore, the government wants the NWNP situation to continue. The people’s sentiment is different. The youth are leaving to avoid serving indefinitely in the military for low pay and low rations. There is a difference of views between the people and the government, with the government wanting the current status to carry on. Presenter: With regards to the Proportional response strategy, is the strategy being implemented? YM: Ok good, let me carry on from where Bereket left off. Firstly, with regards to the government in that region, the government in Asmara, we have to always see it separately from the people. When we talk about Eritrea we are not talking about the Eritrean people or the Eritrean state. The Eritrean people is a victim of this government (Eritrean). The Eritrean people is being dispersed. I have recently seen data that shows that only three quarters lives in the country. A quarter of the people have left the country. The people cannot be a victim more than this. The people are being forced into the military and those who can, are crossing the border despite the ‘shoot to kill ‘ policy of the Eritrean government. There are about 170,000 Eritrean refugees in Ethiopia. This is a big burden to Ethiopia. Despite this being a burden, the policy of the Ethiopian government on refugees, especially Eritrean refuges should be supported 100%. The Shaebia government in Asmara, I am sorry, I find it very difficult to call it a legitimate government. In this day and age, whether it be in Africa or any other region, you don’t see such a murderous dictatorial government. The government has to commit atrocities, engage in dispute/fights with its neighbours, cause its people to fight their neighbours in order to exist. Causing havoc is the bread and butter of this government. What is the Ethiopian governments Proportional Response policy? If a burglar repeatedly burgles your home and all you do is just chase him away he will find different ways to burgle you. Proportional Response is capturing him and handing him over to the authorities. This is not being done to Eritrea. Firstly, this Proportional Response policy has to be redefined. If the Ethiopian government does not wish to change this policy, then at the very least it should give us a detailed explanation as to what it entails. In my opinion, the Ethiopian government has to thoroughly redefine this policy. If we allow the burglar to repeatedly burgle us, then its next move is to take our lives. AM: I would like to raise a point here. My understanding of people’s perception of the lack of the Ethiopian governments proportional response is that, they are wondering why the Ethiopian government does not administer a fatal blow to the Eritrean government. I mean, do you accept this line of thought? Personally I don’t. YN: Thank you, I will continue on that theme. When I say that we either need to accept the Proportional Response policy or redefine it, I am asking what sort of policy we should follow. I will go back to my previous example of the burglar. A burglar must be apprehended. The government in Asmara is a mafia group, a band of robbers and it must be apprehended (taken out of action). Who should apprehend it? Not the Ethiopian government in Arat Kilo, Addis Abeba. There are numerous ways to do this. If a burglar is defined as an enemy and if we have to shoot him, we have to shoot to kill. I have a favourite saying of the late prime minster which says, if we have to shoot, we have to shoot to kill. He was referring to poverty then, but poverty is dying and we have now a more potent enemy. AM: Your thoughts are becoming clear to me, however when we say that we have to administer a fatal blow, we need to be aware of the limitations imposed by the constitution. The Eritrean government is causing more harm to its people than any adverse actions it is taking against Ethiopia. As such, there is a school of thought that Eritreans need to resolve their own issues. The way I see the Proportional Response policy, I say this because I am of the belief that the Ethiopian government is taking these steps. I say this because of the involvement of the Ethiopian government on the imposing of sanctions on Eritrea. The question that should be asked is that, has the Eritrean government through its provocation reached a point whereby it can interfere with major projects in Ethiopia? The question is what is proportional? Proportional is defined from your own perspective. There is no definition of ‘proportional’ internationally. ‘Proportional’ means returning to the state you were in prior to the provocation. For example we want Ethiopia to be peaceful and the response should be able to bring about this. America has gone as far as dropping an atomic bomb on Japan, under questionable circumstances as it could have ended the war through convention means. But chose not to sacrifice a further 500,000 of its soldiers. Therefore, the concept of ‘proportionality’ has its own problems. When we come back to our own situation, the issue is, how big a priority is it? The sanctions have been in place for 10 years as we see now, it has worked in favour of Isaias’ government. The current situation is actually strengthening the Eritrean government, this is because it has been able to convince the people that there is a state of war. I believe that the Ethiopian government is not giving the matter enough focus and its not high on its least of priorities but at the same time I don’t think the solution to the problem is an easy one. We cannot simply go and take over the Eritrean ports. The Russians tried it with Crimea and are now under sanctions and we are no Russia. Regime change is not an easy matter. America has changed about 15 governments but only 1 or 2 can be deemed to be successful, Haiti being one of them. Outside of these few examples, regime changing is costly and near impossible. Presenter: Still on this subject, should Ethiopia’s foreign policy towards Eritrea be tested? FB: There is no doubt. YN: I did not finish earlier and want to continue on the same line. When I said earlier that the Proportional Response policy followed by the Ethiopian government is wrong, it does not mean that we have to go and change the Eritrean government. This is because it is not pursuant of International Law, but there are a lot of things that International Law will allow. International Law is primarily about politics, it is not even law but politics. Its about diplomacy and exercising soft power. I am saying that we are not utilising our soft power effectively and I am not advocating war. However, there are ways of opening war within the confines of International Law. For example, if we are provoked and 80-100 of our people are kidnapped in one day, what are options? Should our response be to just go and rescue them or destroy a factory in retaliation? Can destroying one factory compensate us for the loss of life of one person ? It cannot. Firstly, the value we place on the lives of our Citizens should be raised. This is not just in the case of Eritrea, but we need to value our individual citizens more. There are a lot of countries who have resorted to war because one of their citizens had been kidnapped. These countries are not only placing great value on the individual’s life, but they are fighting for the honour of the entire nation. This is because they feel that an injury to a single citizen is an affront to the entire nation. There are inconsistencies in the Ethiopian government’s policy. Its only short term. It might have helped us for the past ten years to achieve our economic growth, but this growth is being jeopardised by the situation that is developing in Eritrea. This is what we have to look at in the long term. The current situation of the Eritrean government is different to that of 10 years ago. Its a fact that for the past 10 years this policy has been used to isolate Eritrea from the International community. But today, this policy is not the right one. The Eritrean people might have suffered and the Eritrean government to some extent because it has been isolated. However, at the moment about 20 something members of the GCC are causing havoc in Yemen. The Eritrean government has become a key member of this group, allowing the Red Sea to be used for transfer of weapons and the formation of military bases. The Eritrean government is a government under UN sanctions as such, when it is carrying out these activities, do we not have the duty to ask direct questions? This is a massive thing! We should have raised this issue as a serious issue as a crime against the UN. What are we doing about the involvement of the Eritrean government in transfer of illicit arms, bearing in mind that this is a government under a UN embargo? Presenter: What is the current status of Eritrea’s military? BA: When we talk about the army we are talking about the people of one nation. It is the youth that is in the army with some well known personnel in the leadership. The first proclamation in Eritrea was the National Service proclamation. This was something that was in the pipeline even during the Struggle. Was the National service necessary when it was first introduced? It was not. There were other more important issues that should have been given more priority. The main purpose was to mould the Eritrean youth in a certain image. At first the Eritrean youth had accepted the National Service programme as a nation building project. After the fourth round, it became indefinite. The Eritrean army is low spirited, is fed up with the longevity of the service and is routinely made to do menial tasks just to occupy its time. Setting aside the armies capability to fight, lets focus on whether it has the desire to fight. When we talk about the Eritrean Army we are not talking about an army employed with a contract, with adequate resources to carry out its duties. If you check the data of the UNCHR, you will see that most of the refugees were part of the army and who had lost all hope. AM: You have raised a good point . FB: I doubt believe that we have any intention of invading Eritrea, I don’t think the weakening of Eritrea’s army is that much of a concern to us. I also think that there isn’t any concern that Eritrea will invade us. What solution do you propose? BA: We are discussing now about how to normalise the situation. The Eritreans have used very poisonous propaganda over a long period. The Eritrea people have been made to see the government and people of Ethiopia as one. The Eritrean government has no mercy nor concern for the people of Eritrea. There are thousands of underground prisons. The Eritrean government is using all the countries resources on its security apparatus. The Eritrean government has paralysed the people through fear and that is why they have stayed in power for this long. The Ethiopian government cannot help the Eritrean people because they have been conditioned to think that it is their enemy, therefore even if the Ethiopian government goes to help, there might be sections within the society that will not accept the help to change the Eritrean government. Isaias has pitted the people against each other. The government officials are also pitted against each. Distrust reigns. The people have been separated along regional and religious lines. What is the Eritrean opposition doing? There are a number of Eritrean groups? The issue is, can they work together? Is the Eritrean government causing these groups to fail from within? YN: You have raised good points. I have 3 strategies in mind but will not discuss all of them as the government needs to think about them. Strengthen the Eritrean opposition. This can be publicly declared, this is because the Eritrean government is not working to build Eritrea, but is working day and night to destroy Ethiopia. Why have we not been able to do something similar to the Eritrean government? We are not restricted by International Law. Had International Law prevented such actions, the Eritrean government would certainly have been held accountable. Either we could have challenged the Eritrean government when it tried to undermine us. Media institutions which I do not want to mention by name who are working to dismantle Ethiopia, are being sponsored by the Eritrean government. This is well known. Labelling the Eritrean government as a ‘mafia group’ a dictator is not enough. The Eritrean government is working as a conduit for Egypt and all the countries which have animosity towards Ethiopia. Its allowed itself to be the main path through which Arab countries especially those in the Middle East express their animosity towards Ethiopia .We have to seek ways to not only to isolate it from the international community, but drive a wedge to rip it away from the Eritrean people and the Eritrean state. If we are unable to do this, it will come for us after finishing off the Eritrean people. As Berekt said earlier it has paralysed the people through fear. The influence of the Eritrean state media on the mentality of the people is significant. Even when they come hear it takes them 1-2 years to change their opinion about the people of Ethiopia and Tigray. I know a few of them and I can see the poisonous anti Tigray propaganda that they have been inoculated with. It makes you aware of the very divisive propaganda that is being broadcasted from Eritrea. I don’t accept the notion of simply undermining the Eritrean government. Our prime minster has recently said that the threat from Eritrea can be dealt with by the Tigray militia. In light of what Berekt said about the status of the Eritrean army I am not an expert on military affairs. We should not see the dictatorial Eritrean government through the same perspective as we would a democratic government. The Eritrean government is a force for evil, a destructive force. To this end it is carrying out sufficient propaganda campaigns to achieve its aim. We are witnessing its potential to be a destructive force in Ethiopia. There are incidents that we can not discuss but there have been numerous attacks which have been carried out even as far as Addis Abeba. How long will we only just be catching and imprisoning the agents being sent? FB: Let me say one thing on Yemane’s strategy. You have only mentioned one strategy that is why I am focusing on it. The idea of using the Eritrea opposition has issues. There are Ethiopian oppositions or rather terrorists that the Eritrean government uses to cause havoc in Ethiopia and possible start a civil war in Ethiopia. The Ethiopian government does not have similar goals as that of the Eritrean government. Although it might be relatively easy to remove Isaias by bombing Asmara, the Ethiopian government has reservations about regime changing because it might plunge Eritrea into civil war because of the various fundamental division in the Eritrean society. It is not in our benefit to plunge Eritrea into a civil war, therefore using the Eritrean opposition is not a viable opposition for us. We should not seek to strength the Eritrean opposition as I find it hard to see their difference with Isaias. YN: Let me add a bit more. Presenter: We have said a lot on this issue. We are discussing Eritrea because any chaos there would affect us. Should Eritrean refugees be allowed to go to the capital? What if they have an ulterior motive (our agents). But I know that the Ethiopian security services have a vetting procedure from the entry point onwards. It might be the case that they could have by passed these measures. This is a concern we all have. We cannot say that all the refugees who are coming to Ethiopia are innocent victims. If we look at the Eritreans flooding to neighbouring countries it is indeed a very sad thing. The youth is already depleted, if you go to the refugee camps, you will only see mothers with their young children. You might be able to see some youths in the bigger cities. But in the border regions and the country side there is no one. All those who can leave have left, there is no one left behind. AM: Let me add a little on this. The Eritrean migration gives us a clear view about the state of the Eritrean economy and its military status. For example in these past twenty something years after the war, more than 450,000 Eritrean youths have left Eritrea. In two years according to a figure from UNCHR I managed to see, from 2016-2018, 17,000 soldiers have come. The extent of the migration gives us a good picture of the harrowing conditions in Eritrea. However, I am not comfortable calling them refugees. They are like my brothers and sisters, most I have met feel as if they have come back to their country. Earlier concern was raised about them going to Addis Abeba, in fact they are also enrolled in the university there. BA: In Eritrea Amharic songs are widely listened to. Even in the country side they have it on their mobile phones. One of the main tools for the people to people normalisation is Art. YN: When Eritrean refugees go to Ethiopia the fact that we don’t see them as refugees is a big victory. Because this has helped defeat the hatred that is being spread by the Eritreans. You cannot defeat hate with hate but with love. Regardless of the mentality they come with, especially those in the 20-30 age group, who will only bring hate unlike the older ones that had experienced being Ethiopian and still have the sentiments of being an Ethiopian. When we physically consider these people and accept them as Ethiopians, we have to extend to them a welcome very much different to refugees from other countries. However this might have the reverse impact. When we extend a warm welcome to the Eritreans we also have to be mindful of the fact that they can be a threat to our national security as stated earlier. Therefore we have to be able to differentiate the genuinely in need and the others with ulterior motives. We have to be able to determine who is who. Able to know what their connections and roles were in Eritrea. This is a job for the security services and not ours. But there are a lot of stories we have heard which might not be nice. We have to be very careful when extending our help. The one thing I would like to add about helping the Eritrean refugees is that while it is important that they are made to feel at home and given opportunities, what we need to ask ourselves is that why are we condemning them to be refugees for the rest of their lives. The Eritrean youth have been brutalised by Isaias’ government in Asmara and it is this government that has made them refugees. They are therefore the victims of this government. They themselves will ask you to show them how to fight the Eritrean government, therefore can we not help them in this matter? Can we not organize the youth who are seeking change. It has been mentioned earlier that the various Eritrean groups don’t get along with each other. I have followed them closely and have participated in many of their meetings and I know that they cannot work together. The old Shaebia (EPLF) and Jebha (ELF) divisions still exist. But perhaps if we work with the youth that are coming from Eritrea, we can empower them . AM: From the point of view of humanity you are right. Humanity has no border, therefore we should help everyone regardless of their origin. We also have a duty to help them live in their country with their human rights respected.